I wore my dress this past weekend in Chicago, where I had a conversation with an anthropologist friend, Veve Lele. He wondered, What is it about the dress that communicates that it’s vintage? Is it the print? The color saturation? Something about the texture of the fabric that communicates it’s older, more worn? Its silhouette? We had a great discussion about how vintage dress is both an artifact of the past and material objects of the here and now. Today my yellow dress is unique and stands out because we – as consumers – don’t see these prints or exact colors anymore. I love 60s yellow clothing – the yellows vary from sunny lemon to darker goldenrod. I rarely, if ever, see those exact yellows today. I’ve noticed that today’s bright yellows in fashion almost always have a greenish/chartreuse cast to them, and the goldenrods a slight dull orange cast. Older clothing reflects the technologies available in clothing manufacture at a particular time period – the types of weaving machines, knitting machines, fabric dyes, etc. For example, there’s a reason that 1950s tweeds look different than today’s. They were manufactured on weaving machines that no longer exist, and unless someone has an old tweed weaving machine around, they cannot be made again. It is these aspects of vintage clothing that makes them appear unique today. And surveys of vintage consumers have demonstrated that uniqueness is one of the biggest draws of vintage. But is my yellow dress really unique? It’s only time and context that make it so. 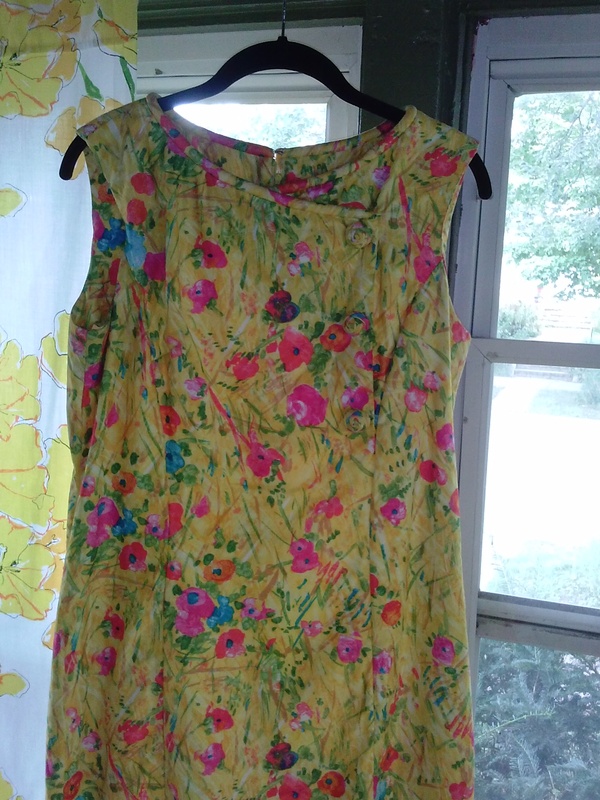 When I bought my dress (at lulavintage in St. Paul), it had a friend – a wide-brimmed hat in the same print, which was unfortunately too small for me. I also seem to recall that I saw this print when I was a child – in fact, I think I had a reversible parka of nearly the same print with green as the background color instead of yellow. My yellow dress no doubt once hung on a rack with its siblings of different sizes. 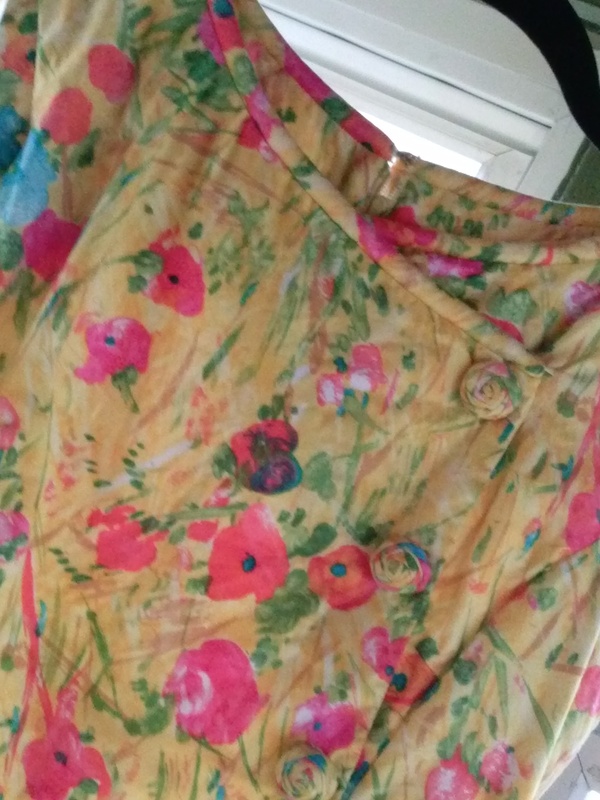 They were purchased, worn, perhaps stained, torn or donated away years ago, leaving my yellow dress the last one standing (at least in its immediate geographic area), so that now it appears unique. In anthropology and sociology, there’s an approach called Rubbish Theory which explains this process. Once mass-market items only become prized antiques/vintage after going through a period of time when most people who encountered them regarded them as rubbish, and discarded them. This makes the remaining items that were forgotten in attics or the back of closets scarce, and therefore more valuable – at least provided that the right kind of people come along and declare such items worth reviving (like how Martha Stewart revived milk glass bowls and dishes as valuable). Thus it’s sort of a survival-of-the-fittest-or-forgotten happenstance that someone held onto my dress rather than turning it into a rag that has made it appear unique in today. And for that I’m thankful.